Do you have a startcode for a competition that you should participate in? Below you are able to read how the activity competition is implemented, what it includes and receive tips on how extra motivation can be created during the competition period. Our activity competitions are set up in a simple and user friendly way so that it suits everyone. On the website to which participants easily have access, there is a guide that describes how the page works and how you get the most out of the activity competition. PERSONAL PAGE AND PEDOMETER. All registered participants receive a start package with a pedometer and log in code to a personal webpage on the site. Teams are formed at the workplace, we suggest 2 - 8 individuals per team. It is necessary for each team to arrive at a previously decided goal before a certain point in time. For example ”Kathmandu – Mount Everest in 60 days”. 10,000 steps & all activities counted. In order to reach the goal i time, everyone on the team must walk or carry out activities corresponding to an average of 10,000 steps per day. You calculate your daily step average with help of the pedometer, or the activity table on the site. All activities are counted and the activity table converts a variety of activities to steps. Follow your and the team’s success on the map. On your personal web page, you can easily follow your own and the team’s success as you register the activity. Here you can also follow other teams involved in the competition. Information brochure on how you register. TIPS AND ADVICE ON LIFESTYLE If desired, our nutritionist can publish motivating articles about health and lifestyle during the competition. 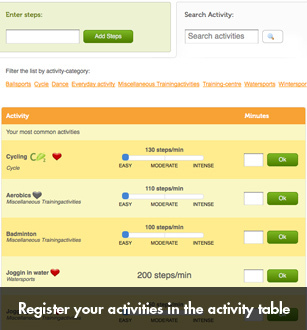 THE ACTIVITY TABLE : register your activities. TOP LISTS: compare yourself with others. CO2-CALCULATOR: Help save the enviroment.Integrated with the activity table. TAPPA WEIGHT access to our lifestyle programme, for instance the calorie check. THE COACH: a programme for those who would like an additional physical challenge. MOBILE FRIENDLY PAGE: register the activity easily with help of the mobile when you are on the go. GUIDE: fast and easy information on how you should use the competition page. MESSAGE FUNCTION: send direct messages to teammates. Motivate each other along the way. SOCIAL SHARING: share activities with your friends through social media. On the personal page you also have access to different top lists. Here you receive, for example, an overview of different departments, individuals and areas of the country. Milestones/ PRIZES: As an additional motivational factor during the activity competition, we recommend adding targets along the way and draw prizes. It is possible to purchase target prizes from Tappa Group. For every 100 enrolled participants, Tappa Group adds 100 EURO in travel vouchers that are drawn among all of the participants on a team that have kept the step average up to the end of the competition.